Voodoo Six, Heaven and Earth, EYE EMPIRE, Revoker, Aerosmith and more. CHRIS AND MATT INVADE SOME COUNTRIES WITH THE NEW VOODOO SIX RECORD CRANKED UP TO 12. THE TWO ALSO DISCUSS BLACK SABBATH, SKID ROW AND YET ANOTHER SUPER GROUP-EYE EMPIRE. 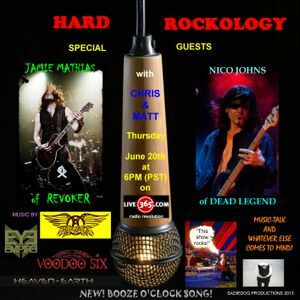 THEY ALSO FIND TIME TO INTERVIEW JAMIE MATHIAS OF UP AND COMING BAND REVOKER AND NICO JOHNS OF LA BAND DEAD LEGEND. THE SHOW ALSO FEATURES THE HARD ROCKOLOGY NEWS SEGMENT.